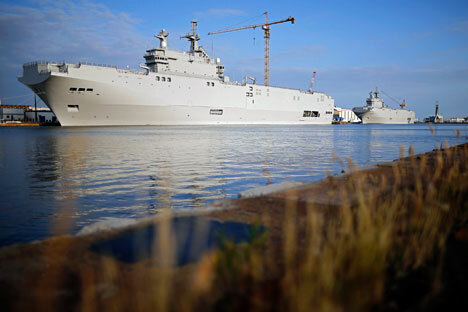 Two Mistral-class helicopter carriers Sevastopol (L) and Vladivostok are seen at the STX Les Chantiers de l'Atlantique shipyard site in Saint-Nazaire, western France, May 21, 2015. There is finally a resolution to the issue of the two French ‘Mistral’ helicopter carriers which Moscow had ordered but Paris did not deliver after tensions over the situation in Ukraine. France has agreed to fully refund Russia the $1.3bn it had paid for the two warships. The purchase of the Mistrals, analysts opine, did not really make sense anyway. Russian officials first thought of purchasing the ships in 2008. This was largely a politically motivated deal; Russian - French ties were on the upswing with French President Nicolas Sarkozy not only playing a crucial part in resolving Russia’s conflict with Georgia, but also helping to minimize its impact on relations between Russia and the West in general. Indeed, the French warships were destined to become “outcasts” within the Russian navy from the beginning. Had the sale gone through, Russia would have become reliant on foreign replacements, which would probably not comply with Russian standards. This could have been tackled if relations with the supplier were good. But in the aftermath of the Ukraine crisis and sanctions being imposed, the situation would have been grim. The ‘Mistral’-class vessels are versatile: They can serve both as flagships and as command and control centres during naval combat. In fact, among the reasons to go for the purchase was to obtain some insights into modern naval combat techniques used by Western countries. However, the main purpose of the Mistral ships is to land and support ground forces on enemy territory while remaining far from the shore. The problem is that Russia does not stage such operations; they are not even mentioned in the country’s naval doctrine. The only thing Moscow could use these ships for would be to land a force in Syria to help President Bashar al-Assad’s regime and, maybe, fighting pirates off the coast of Somalia. But would those missions have really justified such expenses?